The caption in The Economist reads: "Kilim me softly without nukes"
Dr Michael Oren served Israel as its ambassador to the United States between 2009 and 2013. He ran for the Knesset in the February 2015 elections and is now a politician, representing the brand-spanking-new Kulanu Party (created just five months ago). Still, what he says often hits the right note, in our view. So here is an extract from an essay of his, published a couple of days ago on the TIME website, and offering some gently-worded but trenchant criticism of the West's approach - and in particular America's - to the Nuclear Iran deal and what the Persian carpet business ("Iran’s largest after oil") can teach us. ...The Middle Eastern form of negotiating, perfected over thousands of years, should no longer be alien to Westerners. The Palestinians have employed it repeatedly, starting each round of peace talks with “how much are you willing to spend?” If the answer is a Palestinian state based on the 1967 lines with mutually agreed swaps and its capital in East Jerusalem, be assured that this will be their new opening position. The Palestinians — not the Israelis — keep walking away from the table, each time pocketing their newly-obtained concessions. Nobody should be surprised, when discussions on a final nuclear agreement begin, Iranian delegates treat the parameters agreement as the baseline for garnering an even better price. To prevent that, the United States and its P5+1 partners must reject any further Iranian demands. They should make clear to Tehran that it risks losing the gains it has made while facing punitive measures such as ramped-up sanctions. They must be prepared to walk way. At the same time, effective mechanisms must be put into place for rapidly responding to Iranian violations. The world must provide for the possibility that the treaty — like the carpet — will fall apart. The Iranians are not just expert carpet merchants. They also deal in terror and endangering American allies. Proceeds from this deal will no doubt fund those activities. And the Iranians, we know, cheat. For more than 30 years, they have lied about every aspect of their nuclear program, built secret, fortified facilities, violated the Non-Proliferation Treaty, and hidden their previous work on atomic weapons. Still, much of the world wants their carpet. Only later, when its colors quickly fade and its threads unravel, will they discover that, in the Middle East, there is no return policy. Oren's essay, entitled "The Iran Deal and How Not To Buy a Middle Eastern Carpet", is online here. His approach is appealing. But given what is known about Iranian plans for its nuclear efforts and their goals, the analogy he offers needs to be modified somewhat. 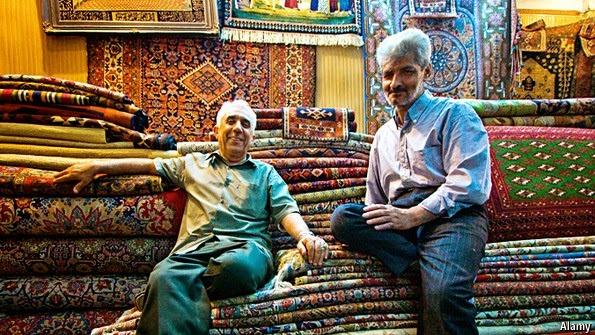 Innocent tourists walking by a Persian merchant's shop may get ripped off but end up with a carpet - perhaps too expensive, perhaps low quality, perhaps bound to crumble soon - but a carpet. No one in these negotiations ever had a realistic basis for thinking Iran's merchants were selling carpets (i.e. ordinary nuclear energy). Their program was in fact weapons-directed at all stages. The negotiators for the P5+1 all know this, knew this, but smile broadly when the cameras are pointed at them. We wonder how. A 2011 film, Iranium, took a long and supremely discomforting look at Iran's real goals and overt guiding principles. It's definitely worth a revisit now; the YouTube version is below. What we will be doing even as we enter into this deal is sending a very clear message to the Iranians and to the entire region that if anybody messes with Israel, America will be there. Mr. Obama’s descriptions differed in key respects from Iran’s interpretations. It can be that way in Persian bazaars.